It is a seven-phase election this time around and ThePrint takes you through the various stages right up to counting day on 23 May. New Delhi: The Election Commission had Sunday announced a seven-phase Lok Sabha elections that will begin next month. Immediately after the Commission, led by Chief Election Commissioner Sunil Arora, announced the polling dates, the Model Code of Conduct (MCC) came into force. Scheduled to begin on 11 April, the long-drawn electoral process will conclude on 23 May, counting day. The new Lok Sabha has to be constituted before 4 June, since the tenure of the 16th Lok Sabha will end on 3 June. ThePrint takes you through how the election process works. Notification: Within three weeks of announcing the elections, the commission will issue a notification after which candidates will file their nominations with the returning officer, who is responsible for overseeing elections in a particular constituency. Scrutiny of nominations: After nominations have been filed, the returning officer will scrutinise all the nomination papers, which include basic information such as the name of the constituency for each candidate, their photographs and other biographical details among others. Candidates have to make a security deposit of Rs 25,000 at the time of filing nominations. For the first time, the candidates are also required to file their social media details. Candidates are also required to file an affidavit declaring their assets, liabilities, educational qualification and criminal antecedents. In addition, the commission has now also made it mandatory for candidates to file their income returns of the last five years, which are all uploaded online. The affidavits are verified by the Central Board of Direct Taxes in addition to the returning officer. Once the EC concludes the scrutiny, candidates are given an opportunity to withdraw their candidature. Campaigning: Once the the model code of conduct is announced, the government comes to a standstill — it cannot announce any policy decisions or make any appointments during this period. Political parties, already in campaign mode, now devote themselves entirely to the elections. They will release their manifestoes, announce alliances, hold rallies, etc. While campaigning has to be suspended 48 hours before polling, no such bar exists on the release of manifestos — which can also influence voters just before polling. Deployment of forces: In order to ensure that elections are free of any kind of violence, coercion or any other malicious activity, there is large-scale deployment of security forces — paramilitary and police — throughout the country. The paramilitary forces include the BSF, CRPF, CISF. 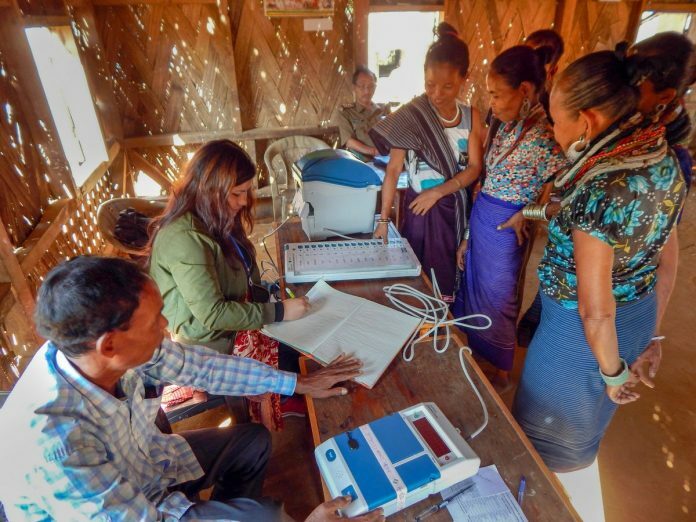 Usually, a deployment plan is prepared at the time of announcement of election dates after the EC conducts a criticality assessment and vulnerability mapping is carried out in various parts of the country. Subsequently, the plan is detailed at least 15 days before the poll day. Flying squads, quick responses teams, static surveillance teams are deployed for this purpose. Polling: Spread over seven phases in 2019, voting occurs 48 hours after campaigning ends. This year, polling will take place across 10 lakh booths, with VVPATs being used at each booth. Around 22.3 lakh ballot units, 16.3 lakh control units and nearly 17.3 lakh VVPATs are expected to be used during polling. The commission is, however, yet to take a call on whether to entertain the opposition’s demand to increase the number of polling stations where VVPAT slips are matched with EVM results. As of now, tallying takes place only in one polling booth per constituency selected at random. Counting and declaration of results: Immediately after polling ends, EVMs are sealed and stored at counting stations. The counting begins on the day assigned by the EC — this time on 23 May. At the time of counting, the serial number of each candidate appears along with the number of votes cast in their name. Counting is done in rounds and as numbers trickle in, the results will be declared at the end of the day after counting of all the rounds is complete. A recount is conducted by the EC in case the need arises.